A first bike should be a memorable experience, so Kawasaki has made the KDX™50 pleasing to young eyes and gave it simple controls so learning to ride is easier. The KDX50 is equipped with a host of features designed to help new riders learn the fundamentals of motorcycle riding, including a single-speed transmission with automatic clutch. As safety is always paramount, adult supervision is made easy with an adjustable power limiter that allows parents to control their child’s speed and progress. The two-stroke, 49cc engine boasts an exceptionally smooth powerband, which is important for kids who are learning throttle control. 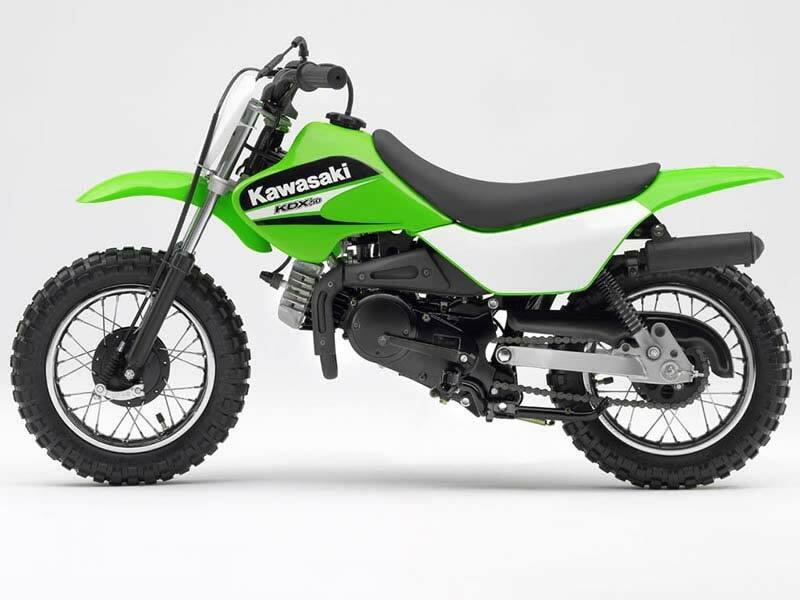 In addition, the KDX50 features height-adjustable suspension, which allows the seat height to be raised one inch to keep up with growing riders. Plus, front and rear drum brakes give the KDX50 ample stopping power, while full knobby tires provide necessary off-road traction. 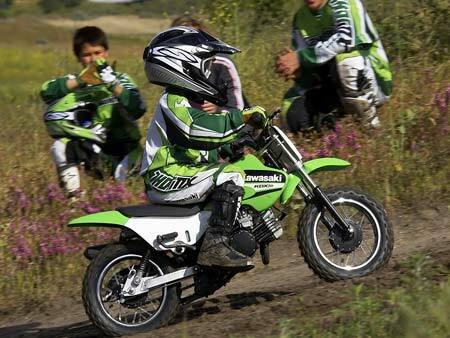 Starting the KDX50 is a breeze, thanks to a digital CDI ignition and child-sized kick-starter. A convenient automatic oil injection system eliminates the need to use premixed gasoline for this little two-stroke. 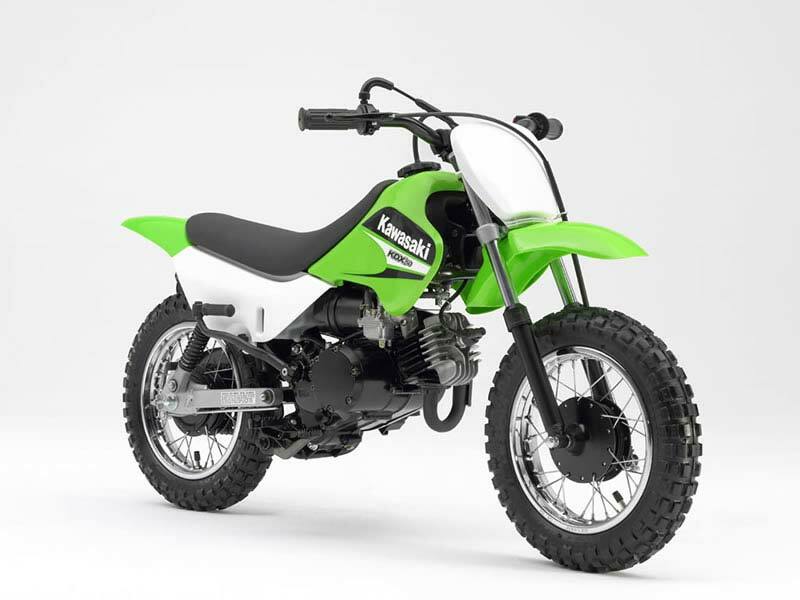 Like the larger displacement KDX motorcycles, the KDX50 comes standard with a U.S. Forest Service-approved spark arrestor. Bodywork and design on the KDX50 are nothing short of stylish, with a 0.53-gallon motocross-inspired plastic fuel tank and fenders covered in Kawasaki Lime Green plastic. Front suspension / wheel travel: Telescopic, two-way height adjustable / 2.8 in. Rear suspension / wheel travel: Twin shock, two-way height adjustable / 2.0 in.